Fitbit is on a roll this year, releasing four fitness trackers designed to appeal to just about everyone. The Blaze is a smartwatch designed to compete with the Apple Watch, the Alta is focused on style, and the Charge 2 is an upgraded version of the popular Charge. Fitbit just upgraded its Flex band, and the second-gen model is a lightweight, affordable activity tracker that easily handles the step-counting basics. The Flex 2’s headlining feature is swim-tracking, but it’s also one of the slimmest fitness bands around, and it’s versatile to boot. Fitbit has a well-stocked accessory store for easily swapping bands on its devices, and this tracker is no different. The accessory bands are a little more luxe than those available for the first-gen Flex. 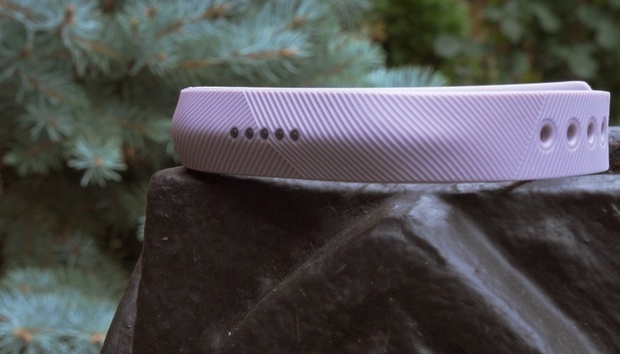 But while simplicity is Fitbit’s mission with the Flex 2, the band might be just a little too basic for most people. Fitbit’s latest devices from left to right: the Flex 2, Alta, and Charge 2. The Flex 2 is 30 percent slimmer than its predecessor, which is the first thing you’ll notice out of the box. The device is ultra lightweight and its classic elastomer band is comfortable to wear, though I struggled with the stainless steel clasp every single time I put the band on or took it off. The waterproofing makes it so you may not have to deal with the clasp very often, but more on that later. The Flex 2 is a device that trucks along silently in the background. Instead of a display showing your daily stats, the band has five LED indicator lights and a vibration motor to notify you when you receive calls, texts, and move reminders. Good luck remembering which light color corresponds to which type of notification. All five lights will kick on when you reach your daily exercise goal, which you can adjust in the Fitbit app. Change your stride length to get more accurate step-counting. The app is the Flex 2’s brain. There you can customize everything from hourly activity goals to sleep-tracking settings to which exercises are automatically recognized and stored. Fitbit’s SmartTrack feature, which is also a selling point of the Charge 2 and Alta, means you don’t have to start a workout in the app or on the device to log your data. In theory, this is incredibly useful, but on a device without connected GPS, like the Flex 2, the automatic tracking isn’t altogether accurate. That could be due to the Stride Length setting in the Fitbit app, which is calculated automatically and accurately by Fitbit’s GPS-equipped devices. The Flex 2 went awry, though, and its preset walking and running stride lengths for me were completely off-base. That resulted in overestimates for daily step counts and running mileage. You can tweak your default stride length in the Fitbit app, though it requires some calculation on your part: You have to walk or run in a location where you know the exact distance, then count your steps til you hit at least 20. Then divide the total distance in feet by the number of steps. That’s your stride length. You could also go for a walk and track it using Fitbit’s exercise-logging feature and do the same calculus of distance divided by steps, but either way you’re doing math. Sorry. That’s a little bit more work than I would prefer to do for accurate automatic exercise-tracking out of the box, but the Flex 2’s price point, appearance, and other features might make up for it. The Flex 2 is definitely resistant to water, which is perfect if you don’t want to take the band off during the day. It can go from workout to shower to office to bed without ever leaving your wrist, if that’s how you roll (and I did that for a week). The Flex 2 doesn’t log much data on your swims. As with other exercises, the Flex 2 tracks swims automatically, but you have to turn on that feature in the Fitbit app under Account > Exercise > Swimming. It’s off by default to save battery, Fitbit says. Toggle on auto-recognize and select the minimum length of time to swim before the Flex 2 starts tracking your strokes. The default is 15 minutes, but you can adjust it down to 10 if you’re not an endurance swimmer. There are more swim setttings you can adjust in a difference section of the app, under Account > Advanced Settings > Swim Settings, for inputting the length of your pool in meters or yards for more accurate measurements. Swimming isn’t my go-to workout, so I’m not sure I have the kind of strong, continuous strokes you need for the Flex 2 to properly do its job, but the data the app logs isn’t very helpful—all you get is time elapsed, calories burned, and how many lengths you swam (which won’t be that accurate if you didn’t add the pool length in-app before you started). I found the Apple Watch Series 2 to be more effective at tracking my swims because it does so in real-time on the display, regardless of whether you take breaks or switch up your strokes. People who are actually good at swimming might get more use out of the Flex 2—and it’s $250 cheaper than the Series 2, a fact that can’t be discounted. The Flex 2 tracker detaches from its band and charges via a USB cable. The Fitbit Flex 2 is a great basic activity tracker. Step counts, sleep data, and automatic workout-logging, complete with swimming stats (a valued feature that more companies are getting on board with), make this $100 band a solid buy. But for fitness enthusiasts, the Flex 2 is just too barebones. Its LED lights are hardly as informative as a display, which you get for $30 more with the Fitbit Alta (though you’ll sacrifice the water-resistance with that device). The Fitbit app picks up a lot of that slack, so you can use your phone to track workouts with its onboard GPS, but that defeats the purpose of SmartTrack. The Flex 2’s battery life is a paltry five days, just like the Charge 2, but that device has a heart rate sensor and full display. For a tiny tracker with just an accelerometer built in, even with LED lights, the Flex 2’s battery should last longer. To compare, Misfit’s $120 Speedo Shine 2 also offers sleep- and swim-tracking with LED lights to serve up notifications, and its coin-cell battery lasts six months. But the Flex 2 is a solid addition to Fitbit’s lineup, and its price point is fitting for an upgraded entry-level fitness tracker. If you have more than $100 to spend, I recommend the Fitbit Alta over the Flex, unless water resistance is a must-have.